We all know backlit panels and flat panel video arrays are all the rage in set design — but who could overlook building a news set from piñata materials?! KENS-TV, the Gannett CBS affiliate in San Antonio hasn’t. 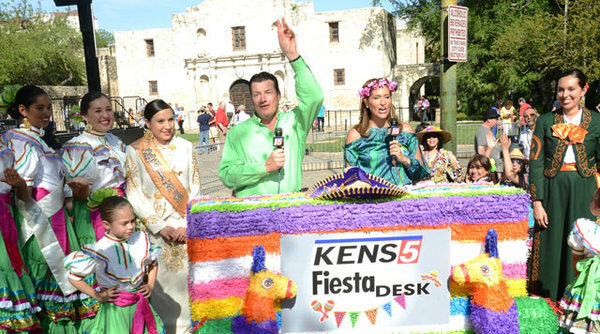 The station unveiled a 70-inch wide, 38-inch tall and 20-inch deep “Fiesta Desk” for its coverage of the 2014 Fiesta celebration. The desk, which is stationed in front of the Alamo, was made by local business Becky’s Pinatas and took about two days to complete. A project of this scale would normally have taken weeks, according to the business owners. We have to say piñata anchor desks, decked out with fun streamers and bold colors, certainly look more inviting than ones made out of ice.